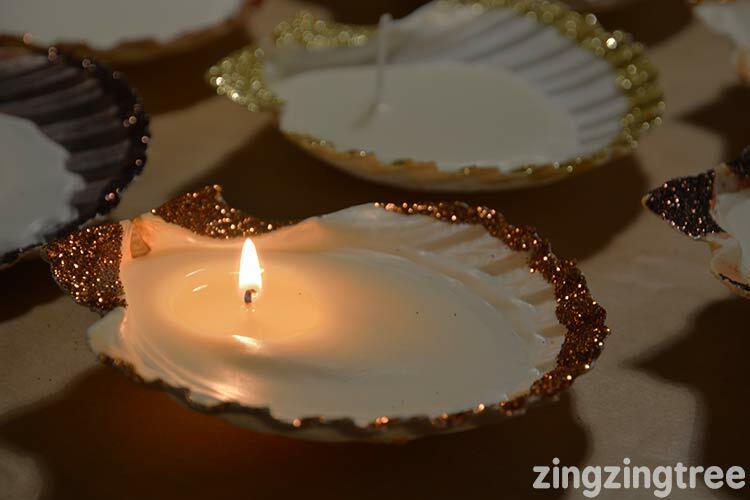 Add some warm soft light to you interiors by making these beautiful glitter seashell candles out of scallop shells. 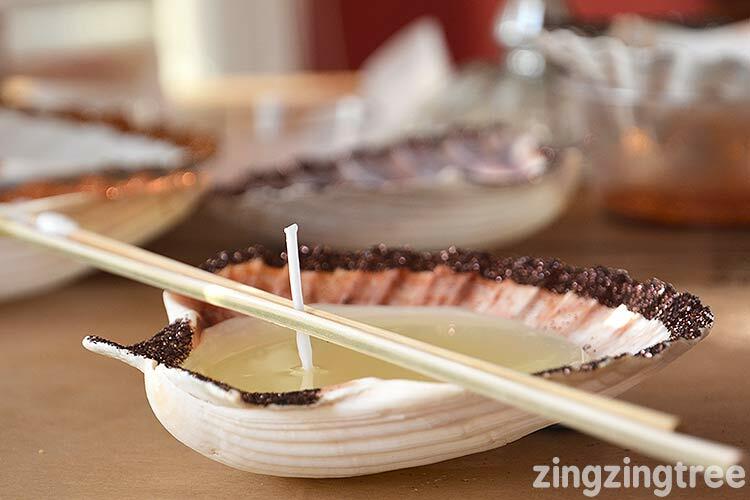 The large shell with it’s warm colouring make the scallop shell the perfect vessel for homemade candles. Plus it holds enough candle wax to easily last through an evening or more. I like to stick to compliment the colours on the seashells and use warm metallic glitters … hues of orange, copper, bronze, gold, brass, pewter etc that add to that warm cosy feeling. Scissors (to cut wick depending on how long it is. 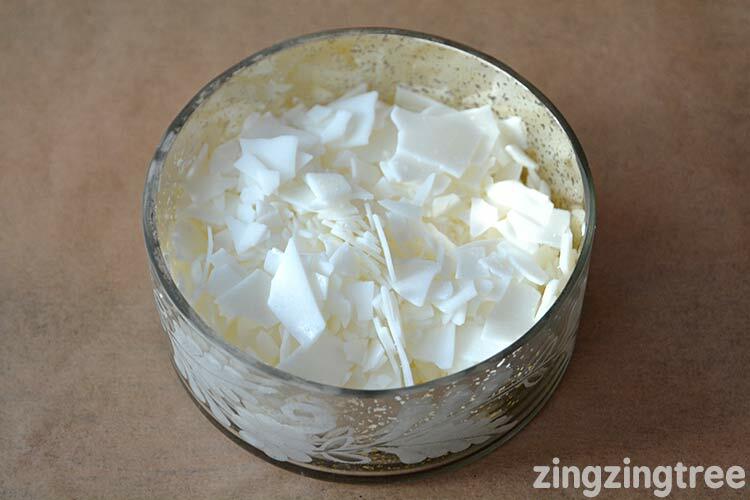 I use soy wax chips that you can easily buy on line but you can also use paraffin wax, bees wax etc or even melt down your tea light wax. 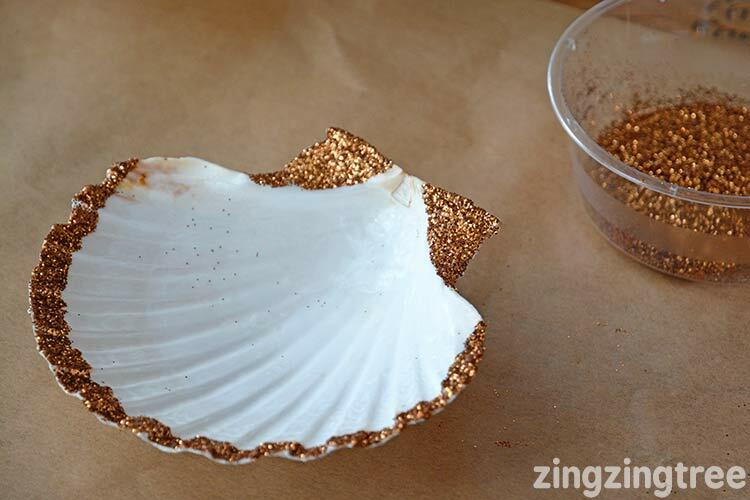 Using a paint brush put an even coat of PVA (white) glue around the edges of the shell where you want the glitter to be. 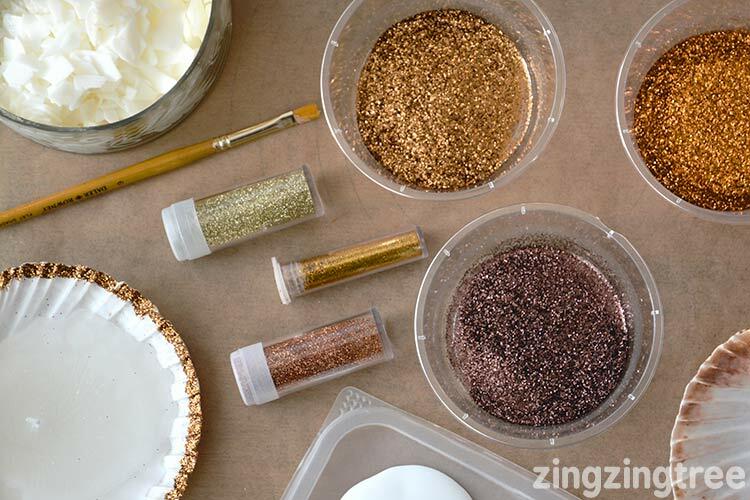 Sprinkle with glitter and tap off and excess. I use baking paper/greaseproof paper to catch the glitter on as I find the glitter slides off more easily than standard paper. Scallop shells naturally dip down, so find something to prop the underneath of the shell up before you fill it with your wax. Melt your wax either in the microwave. I use a paper cup to melt the wax in giving it a zap in the microwave for 2 minutes on high. This fills around 3-4 shells depending on how much wax you put in. You can use a wick with a metal base which makes setting it in place a little easier or if like me you use just a waxed wick you will need something to support the wick whilst the wax set. I find a couple of wooden skewers to lolly stick works really well. The metal base wicks are better to use with large sea shells like this as the stand alone wicks will topple over when the wax turns liquid as it least up. Add the wick just as the edges of the wax start to set. You cam also add some aromatherapy oils to the melted wax before you pour it into the shells. For a festive feel try clove, cinnamon and cedar wood (or myrrh). I like to mix them up so will add 5 drops of each. Theses larger sea shell candles will last for a few days depending how long you leave them burning and they are very easy to refill after wards. 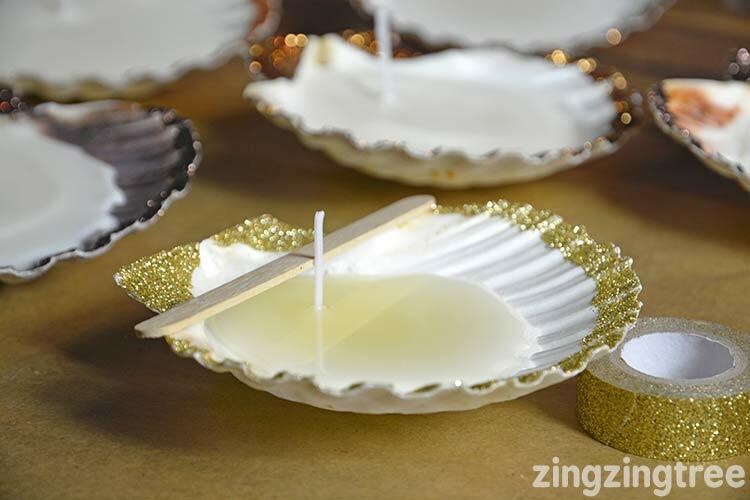 Ahh I did some sea shell candles a while back but I’m loving your addition of glitter to the tops – so pretty. 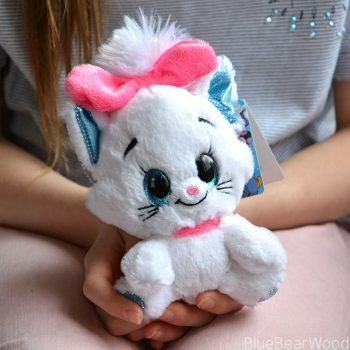 This is such a pretty craft to do – you could even make these to give out as lovely gifts! 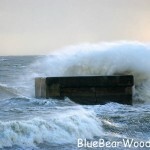 I have got some large shells from some scallops we had and I knew there was a reason I kept them! This is a very clever idea. I’ve never made candles, but it looks very easy and yours look great.